While our ongoing late winter thaw is allowing the Phactors to do a bit a gardening, it may push some stoopid plants to break dormancy too early. This is always a worry in this part of the world. Some of the very earliest plants are flowering, but this is not unusual for them. The weather leading up to this thaw has been windy, so it took a good hour of bending over to pick up all the downed limbs; nearly 3 wheelbarrow loads of limbs and twigs were transported to the front curb for pickup later in the week. A fence along the lily pond had accumulated quite a load of leaves and kept them out of the pond. Mrs. Phactor raked them up and transported them to a woodland area where they can decompose in peace. Put a fence around a bed filled with species tulips hopefully depriving the bun-buns of an exotic meal. Usually they get missed until nibbled down. Made note of the shrubs that have been bun-bun nibbled over the winter. Basically anything not caged. This was our day's exercise. Gardening as exercise is not such a crazy idea, but in general the exercise nuts are not the type who garden, wonder why not? Not enough of an an adrenaline rush watching grass grow? Good to note that the blue lawn is sprouting under foot everywhere. Stay posted. Friday Fabulous Flower - And the winner is - witch hazel! It's the 23d of February; technically still the dead of winter. But we've had good snow cover so bulbs do well beneath the snow cover, and now it's in a bit of a winter thaw and the tips of leaves are showing all over the place. The real contenders were snowdrops (a close 2nd), winter aconite, and witch hazel. 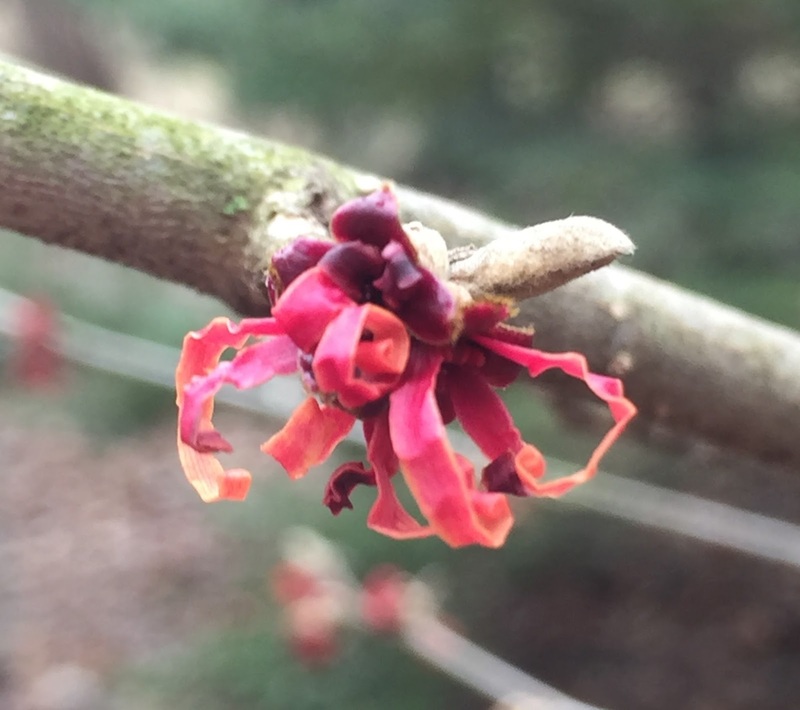 This particular flower is from Hamamelis x. intermedia 'Diane". She differs from 'Arnold's Promise' in having reddish-orange flowers in the spring; if she flowers in the fall they are yellow like Arnold is in the spring. This is by no means a record, 'Diane' has flowered as early as the 12th of February (last year). Not only is TPP looking for signs of spring like the snowdrops poking up in places, but an annual rite revolves around making corned beef for St. Patrick's Day. So this Saturday past the pickling brine was made and 10 lbs of beef brisket began its journey. Fortunately TPP had enough saltpeter for the recipe, but the supply is low so more will have to be ordered to have on hand for the next year's batch. The recipe has been posted before, here, should you care to try it. Getting saltpeter used to be as easy as walking into a pharmacy, but now it has to be ordered just in case someone uses corned beef as a cover for building a bomb. Sorry for being a day late with a FFF, but yesterday was largely lost to a medical procedure, which turned out well (no problems -yea! ), but is quite wretchedly awful to prepare for. So largely lost the day. And what with the national news being so depressing, and our so-called leaders being so terribly depressing (please do not get TPP going), the primary thought was to find something cheerful. As the area is in a semi-thaw, although snowing quite nicely just now, did a walk around the mid-winter gardens. Cheerful observations: lots of bulbs poking up and things like snowdrops could flower any time; early shrubs have swollen buds (Cornus mas, witch hazel showing some red petals), a whitish flowered Hellebore (H. x ballardiae 'cinnamon snow'), a so-called Lenten rose, has buds showing among last year's leaves. 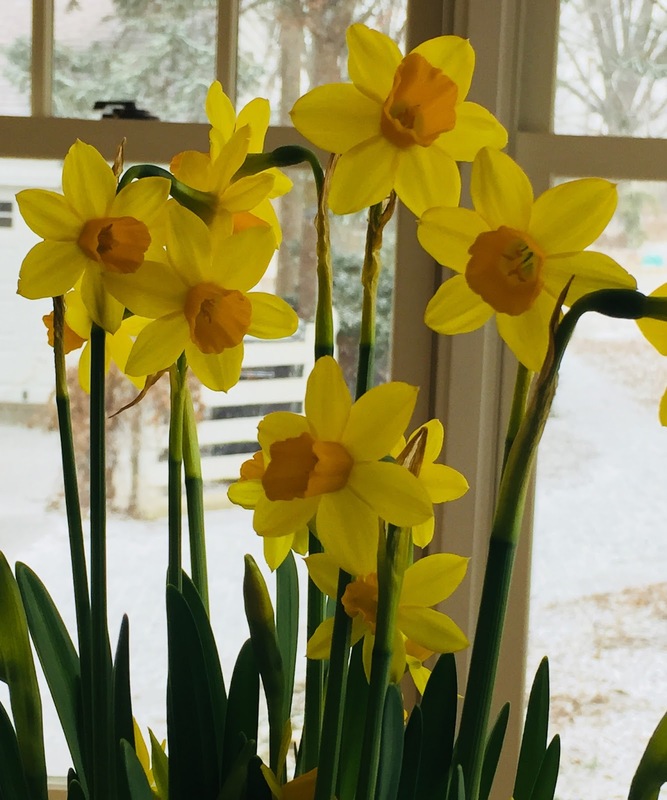 As those things were cheerful TPP decided a pot of forced daffodils, a smaller-flowered variety, purchased for Mrs. Phactor would be featured. Hope they cheer you up too, if not, get off to the nearest flower shop and buy yourself some cheer. It'll be worth it! One of the best things about traveling is seeing new things. Rather garish bright green and purple vehicles were seen here and there around New Zealand bearing the appellation "Jucy Lucy", often with some semi-rude comment and a suggestive picture or two of a modest enough pinup variety. No idea what they were all about. Now if you go into a bar and grill especially in Minnesota and order a juicy lucy, you will get a rather fat hamburger with a melted cheese filling oozing out of the middle. It will indeed be juicy. All logic and reason told TPP this was not what the green vehicles were all about. Turns out they are a camper style rental vehicle that loudly advertises their presence. You have to sort of like their attitude. Quite certain that even if they experience a bump in business TPP will get nothing out of it, but the amusement factor was enough. Have you noticed the floral sections located usually near the entrance of grocery stores? Lots of flowers and rather reasonable in price too. This was more common in Europe, but now has become commonplace here in the states. If Kroger is doing it, that's a clue. At any rate such large scale operations are quite mind-boggling, and this video is worth watching no matter what you think of such practices. And of course posted just in time for Valentine's Day. TPP is not a huge fan, but finds the operation quite interesting and they are so well automated, so huge! Hate to think about the pesticides & fungicides being sprayed around. February 12th, 2008. The Phytophactor Blog was born 10 years ago and now some 2900+ blog posts later The Phytophactor still labors on. This is actually pretty hard to believe. The blog started off rather slowly, and early on, for the first couple of years, the Blog didn’t manage to keep any stats, so who knows how many people came and went in those days, it was not a large number. The visibility and readership volume improved greatly after joining the Field of Science collective. The number of page reads is well over 1.5 million, and the blog gets some 500 to 700 visits a day. The all-time most popular blog post is whether the artichoke is a fruit or a vegetable, published in the 1st month of the blog's existence. So it is also old, and in the old, harder to read, small font. Altogether that short little blog accounts for just over 10% of this blog’s total traffic. People also care about whether flowering kale can be eaten (yes) and if pollen is equivalent to sperm (no). Who knew those were such pressing questions? The Friday Fabulous Flower is the most popular and basically only regular feature. This blog doesn’t stimulate much in the way of comments, so it is hard to tell what people like, or don’t like. As the national news has gotten so depressing TPP has blogged about it less, and similarly, when your academic counter part retires, you find you don’t follow the academic life so much. So those areas get less coverage than they once did or the get covered less frequently than before. But the botany and the gardening carry on. Careful readers probably can list TPP's favorite house and garden plants because of the number of times they have been featured, and gardening pet peeves (poodle pruning of shrubs). Today is also Charles Darwin's and Abraham Lincoln's Birthday (in the same year), and much more recently TPP's kid sister's birthday. Congratulations to all. TPP has been at a loss to blog about the current POTUS, so when someone else does such a good job, they must be acknowledged. "I did not choose Donald Trump. I did not choose his “Shithole version of America.” I did not choose his overt racism and bigotry. I did not choose his favorable attitude to white supremacists. I did not choose his incessant and often ridiculous lies. I did not choose his narcissistic ways and complete lack of empathy for anyone other than himself. I did not choose his cruelty. I did not choose his personal attacks on individuals from the office of the president. I did not choose his inherent bullying nature. I did not choose his crudeness or vulgarity, and his attacks on women and their appearance. I did not choose his attacks on Mexicans or Haitians, and I did not choose his contempt for African American sports stars. I did not choose his failure to understand the constitution. I did not choose his failure to comprehend the meaning of free speech. I did not choose his attacks on the press. I did not choose his ignorance, his lack of morality, his complete inability to grasp complex concepts, and his non-existent attention span. I did not choose his bragging. I did not choose his cronyism. I did not choose his corruptness. I did not choose his nepotism. I did not choose his tendency to make every issue, first and foremost about himself. I did not choose the way he brings out the very worst in the people of this country. And most importantly, the majority of American voters did not choose Donald Trump." More here. How can one guy do so much that's bad in such a short period of time? Got to like this guy.